Paris Couture Week has ended, which means it is time to do some predicting on what we might see in a few weeks on the red carpet. Like last year, I have creepily pasted the actresses heads on the models from the runway. So hilarious, but helps you see what it would look like more! Here are some dresses I think would be gorgeous. Amy Adams would be a dream in this Monique Lhuiller. She loves a classic shape, but this lace is so soft and pretty and would look great with her red hair. 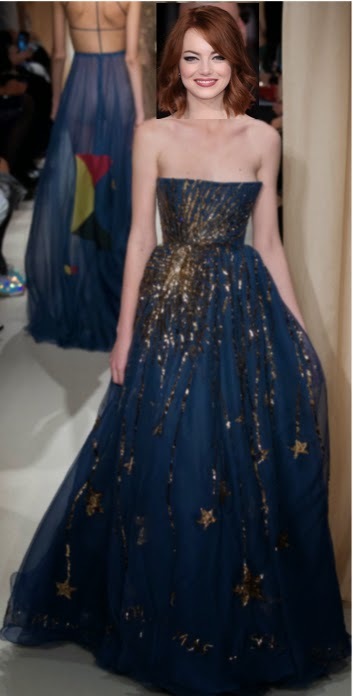 Emma will probably be in custom Lanvin, her fave, but if she were to pick off the runway this Valentino would be so pretty on her. The color is perfect! Felicity seems to like structure and this white dress with the yellow bustle is so pretty. Yellow was a huge trend, so I think we will see some come Oscar night. This is by the new cool girl designer, Rosie Assouline. Obsessed with her and this dress. Julianne loves a Tom Ford, but this Valentino would be fantastic on her. Just the right color bronze and the structured top with the flowing skirt is a great mix. 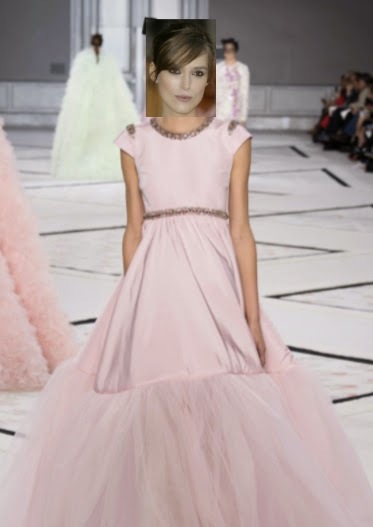 Preggie Keira likes a little volume, so this Giambattista Valli would be so sweet on her. This dress screams Keira with the cap sleeve, soft pink, and just a little bling. Lupita is going to turn it out and this Oscar de la Renta would be unreal on her. The most gorgeous coral with a pop of yellow. So fun and so her. Obsessed with the shape of this dress. Marion is pretty loyal to Dior, but this Giambattista Valli would be perfect. The shape and floral appliqué would be a stand out on the red carpet. You are probably confused on this one, but hear me out. Imagine if Ralph Lauren made this in white for Naomi. White! She loves a collar necklace and this is quite a work of art. I love the ornate top and the simple and perfectly cut dress. Reese always goes a little sweet when she dresses and this has a bit of a nod to her Southern roots in the lace. You can't go wrong with Oscar on Oscar night either. Rosamund is a wild card, which I love. She certainly does not go safe. Though the girl needs some better tailoring and structure in her life. Yellow would be so pretty on her and the lace gives it originality. By Naeem Kahn. Sienna is my girl crush, always. She is not going to go all glitz on the carpet and usually dresses more for comfort and ease. This Jenny Packham is a beauty and would be so great on her. Lace would be a huge departure and unexpected. Someone needs to wear this Naeem Khan. Dakota is a great candidate. Well My prediction is right about you and your prediction also right.